27-Dec-2001 -- 26N 81W Well it is possible to get there. We headed out of Pensacola on Dec 22. After spending 12/24 at Sea World and 12/25/001 at Bush Gardens with the grandkids, my wife and I headed to the Everglades so that I could play. We took Hwy 41 to 25 51.450N 81 02.06W. This is the location of the US Government Oasis Ranger Station. This is a visitor center for the Big Cypress National Preserve. We arrived at around 3:00pm. I was able to speak with a couple of Park Rangers and found that my desired target was not far off of the Florida Trail. This is part of the National Scenic Trail. This section that runs from Hwy 41 to I 75 is approximately 30 miles long. The park even provided a brochure that had a rough approximation of the location of the trail. After some discussion with the rangers, it was determined that it would indeed be possible to get to the confluence. The ranger seemed more concerned over the hazard of having hunters throughout the preserve than any danger of terrain or critters that I might encounter. With this knowledge, I decided to wake at first light and give it a try. There was a camp ground about 2 miles up the road so we moved the motorhome there and spend the night. The next morning 12/27/01 we went back to the Visitor Center and I prepared for the trek. I took a backpack with the following items. Camera, Garman GPS12, 2 vhf two-way radios, two cracker snacks, Nikon 950 digital camera, one small flashlight, 12oz of fresh water, a butane lighter, and one T-shirt (See photo). The GPS showed that the straight-line distance to the confluence to be right at 10 miles. I got started at 9:30am. Calling this area a swamp is a misnomer. The land consists of islands of slash pine, mixed hardwood hammocks, wet prairies, dry prairies, marshes and mangrove forest. This trail is an encounter with all of these various terrains. About 2/3 of the trek could be considered wet. Anywhere from mucky mud, ankle deep water to knee deep water. Much of the route consisted of a limestone base containing “pot” holes of from 6 to 14 inches by 3 to 12 inches deep. Many of the wet areas also had cypress knees that are about 12 inches high. All of this makes for many tripping hazards and very slow hiking. 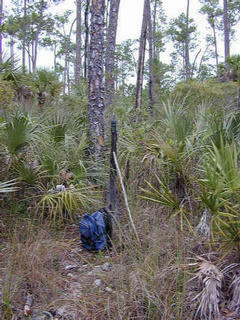 The trail is marked with colored paint on trees, however, it is very easy to miss a marker and be off of the trail. On the way in there were at least 3 different times that I got off of the trial. It can be very difficult to get back on track. On the return trip, which for the most part was in total darkness, I got off the trail twice. It took nearly twenty minutes to find my way back to the trail. At one point, I was sure that I was going to have to just bed down and wait for daylight. Right at that point I just happened onto a trail marker and was back on my way. All in all it was a very good trek. I guess, in all, the total distance traveled was around 22 miles in 12 hours. If anyone else makes this trip plan to spend the night and do not travel at night. I completely underestimated the time required. I also did not have a tent or sleeping bag to take so I figured hiking at night was about as equally unpleasant as spending the night under those conditions. As far as scenerary is concerned, there was only a variety for about the first two hours. After that it was just a repeat. I needed to take extra GPS batteries. By the time I got on site the set for the GPS were about dead and it had a hard time staying locked on position. As to critter encounters, on the way in a variety of birds and water fowl. On the way out I saw one bear on the far side a prairie, a distance of about 60 to 70 yards. One 10 foot alligator decided to take up residence on “my” trail. After about 10 min., he decided to move on. Then right at dusk a Florida Panther darted across the path about 40 yards ahead of me. After dark I heard hogs but never saw any. I was able to communicate with my wife via VHF radio for a distance of about 5 miles. In the Big Cypress National Preserve.